Bluechocolate Diaries: Back to the ER ! Back to the ER ! Well not exactly the ER, the urgent care center. If you will take a walk down memory lane with me, you will remember that my youngest ended up there on the fourth of July last year for a split chin. See that post Here. Well my friends it happened again. This time I was having lunch with a couple of friends after work when I heard my phone go off. It was my husband, and apparently both he and the school were trying to get a hold of me because Alex, you guessed it split her chin on the playground. Now at first I didn't know that piece of information. I found that out in between rushing out of my friends house and driving to the school. No biggie as long as all her teeth are fine, I'm cool. Do you want to know why? Because Alex is accident prone, the night before she'd left her tutu on the floor and promptly slipped on it. Which meant she ended up face first on the floor. No my problem today wasn't her splitting her chin, though I would rather she hadn't done it. NO, it was finding some place that would patch her up. Now, I left the school with the two girls in tow and called their pediatrician. 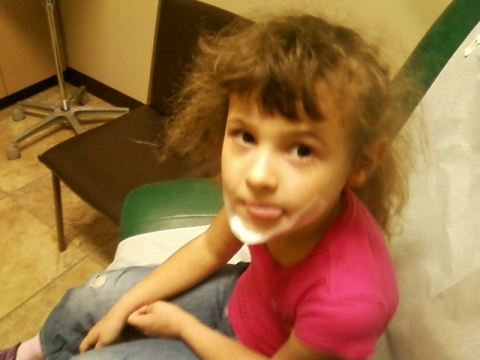 The pediatricians office wasn't going to be able to help me at that location because their was no one who was qualified to stitch her up. OOOK. But they would send me to Maitland some thirty minutes away with no guarantee anyone would touch her, because they might want to refer her to a plastic surgeon. Alright so I made the appointment but I continued to look for an urgent care center. The one we went to int he past was closed until after hours, The one closest to us had shut down I found that out after I pulled up to it. My friend with whom I'd had lunch was kid enough to recommend a place she gone to before which was closer to her house. They did a wonderful job and i was able to pick up my hubby on time while fielding calls from the grandparents. As my friend Mick Likes to say, "Never a Dull moment." The post I had in mind for today may make an appearance tomorrow. Hope you guys had a less eventful day than I had. Geez - not again! Maybe you should keep her wrapped in bubble wrap. Sorry to hear about your ordeal. Ouch!!! What a trying day for you both. Kudos for keeping it together, I'm quite sure I wouldv'e came UNGLUED at some point between all the running around & trying to pin down medical care. Wynter- I'd love the bubble wrap option but ut wouldn't work she'd just work her way out of it. LaTessa- was close to coming UNGLUEd when the doctors office wouldn't guarantee they'd be able to patch her up. But a friend reminded me this morning that they're afraid of getting sued. See how one bad apple spoils the bunch. Photo Friday! Maya in all her glory. music monday! Audioslave- Your time has come.